This set of exercises guides the student in exploring computationally the behavior of light patterns and shadows generated by simple light sources together with apertures in thin, opaque barriers. It requires the student to generate, and describe the results of simulating, light patterns and shadows. Diffraction is ignored. The numerical approach used is summing over a two-dimensional spatial grid while applying a logical mask (‘transparency function’). Please note that this set of computational exercises can be affordably coupled to simple experiments with small light bulbs and apertures cut into (or barriers cut out of) opaque paper sheets. A possible extension is to compare the predicted light patterns to experimental measurements. This set of exercises could be incorporated as an initial activity in an intermediate optics laboratory. 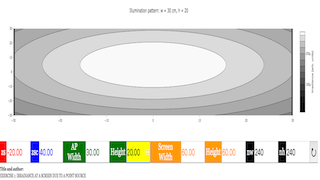 predict and visually represent the irradiance distribution at a screen generated by a two-dimensional array of point light sources and an opaque barrier (Exercise 5). We imagine that a point source of light at Ps=(xs,ys,zs)Pstyle="padding-top: 0px; padding-right: 0px; padding-bottom: 0px; padding-left: 0px; border-top-style: none; border-top-width: 0px; border-right-style: none; border-right-width: 0px; border-bottom-style: none; border-bottom-width: 0px; border-left-style: none; border-left-width: 0px; display: inline; margin-top: 0px; margin-right: 0px; margin-bottom: 0px; margin-left: 0px; line-height: normal">sstyle="padding-top: 0px; padding-right: 0px; padding-bottom: 0px; padding-left: 0px; border-top-style: none; border-top-width: 0px; border-right-style: none; border-right-width: 0px; border-bottom-style: none; border-bottom-width: 0px; border-left-style: none; border-left-width: 0px; display: inline; margin-top: 0px; margin-right: 0px; margin-bottom: 0px; margin-left: 0px; line-height: normal">style="padding-top: 0px; padding-right: 0px; padding-bottom: 0px; padding-left: 0px; border-top-style: none; border-top-width: 0px; border-right-style: none; border-right-width: 0px; border-bottom-style: none; border-bottom-width: 0px; border-left-style: none; border-left-width: 0px; display: inline; margin-top: 0px; margin-right: 0px; margin-bottom: 0px; margin-left: 0px; line-height: normal">=style="padding-top: 0px; padding-right: 0px; padding-bottom: 0px; padding-left: 0px; border-top-style: none; border-top-width: 0px; border-right-style: none; border-right-width: 0px; border-bottom-style: none; border-bottom-width: 0px; border-left-style: none; border-left-width: 0px; display: inline; margin-top: 0px; margin-right: 0px; margin-bottom: 0px; margin-left: 0px; line-height: normal">(style="padding-top: 0px; padding-right: 0px; padding-bottom: 0px; padding-left: 0px; border-top-style: none; border-top-width: 0px; border-right-style: none; border-right-width: 0px; border-bottom-style: none; border-bottom-width: 0px; border-left-style: none; border-left-width: 0px; display: inline; margin-top: 0px; margin-right: 0px; margin-bottom: 0px; margin-left: 0px; line-height: normal">xstyle="padding-top: 0px; padding-right: 0px; padding-bottom: 0px; padding-left: 0px; border-top-style: none; border-top-width: 0px; border-right-style: none; border-right-width: 0px; border-bottom-style: none; border-bottom-width: 0px; border-left-style: none; border-left-width: 0px; display: inline; margin-top: 0px; margin-right: 0px; margin-bottom: 0px; margin-left: 0px; line-height: normal">sstyle="padding-top: 0px; padding-right: 0px; padding-bottom: 0px; padding-left: 0px; border-top-style: none; border-top-width: 0px; border-right-style: none; border-right-width: 0px; border-bottom-style: none; border-bottom-width: 0px; border-left-style: none; border-left-width: 0px; display: inline; margin-top: 0px; margin-right: 0px; margin-bottom: 0px; margin-left: 0px; line-height: normal">style="padding-top: 0px; padding-right: 0px; padding-bottom: 0px; padding-left: 0px; border-top-style: none; border-top-width: 0px; border-right-style: none; border-right-width: 0px; border-bottom-style: none; border-bottom-width: 0px; border-left-style: none; border-left-width: 0px; display: inline; margin-top: 0px; margin-right: 0px; margin-bottom: 0px; margin-left: 0px; line-height: normal">,style="padding-top: 0px; padding-right: 0px; padding-bottom: 0px; padding-left: 0px; border-top-style: none; border-top-width: 0px; border-right-style: none; border-right-width: 0px; border-bottom-style: none; border-bottom-width: 0px; border-left-style: none; border-left-width: 0px; display: inline; margin-top: 0px; margin-right: 0px; margin-bottom: 0px; margin-left: 0px; line-height: normal">ystyle="padding-top: 0px; padding-right: 0px; padding-bottom: 0px; padding-left: 0px; border-top-style: none; border-top-width: 0px; border-right-style: none; border-right-width: 0px; border-bottom-style: none; border-bottom-width: 0px; border-left-style: none; border-left-width: 0px; display: inline; margin-top: 0px; margin-right: 0px; margin-bottom: 0px; margin-left: 0px; line-height: normal">sstyle="padding-top: 0px; padding-right: 0px; padding-bottom: 0px; padding-left: 0px; border-top-style: none; border-top-width: 0px; border-right-style: none; border-right-width: 0px; border-bottom-style: none; border-bottom-width: 0px; border-left-style: none; border-left-width: 0px; display: inline; margin-top: 0px; margin-right: 0px; margin-bottom: 0px; margin-left: 0px; line-height: normal">style="padding-top: 0px; padding-right: 0px; padding-bottom: 0px; padding-left: 0px; border-top-style: none; border-top-width: 0px; border-right-style: none; border-right-width: 0px; border-bottom-style: none; border-bottom-width: 0px; border-left-style: none; border-left-width: 0px; display: inline; margin-top: 0px; margin-right: 0px; margin-bottom: 0px; margin-left: 0px; line-height: normal">,style="padding-top: 0px; padding-right: 0px; padding-bottom: 0px; padding-left: 0px; border-top-style: none; border-top-width: 0px; border-right-style: none; border-right-width: 0px; border-bottom-style: none; border-bottom-width: 0px; border-left-style: none; border-left-width: 0px; display: inline; margin-top: 0px; margin-right: 0px; margin-bottom: 0px; margin-left: 0px; line-height: normal">zstyle="padding-top: 0px; padding-right: 0px; padding-bottom: 0px; padding-left: 0px; border-top-style: none; border-top-width: 0px; border-right-style: none; border-right-width: 0px; border-bottom-style: none; border-bottom-width: 0px; border-left-style: none; border-left-width: 0px; display: inline; margin-top: 0px; margin-right: 0px; margin-bottom: 0px; margin-left: 0px; line-height: normal">sstyle="padding-top: 0px; padding-right: 0px; padding-bottom: 0px; padding-left: 0px; border-top-style: none; border-top-width: 0px; border-right-style: none; border-right-width: 0px; border-bottom-style: none; border-bottom-width: 0px; border-left-style: none; border-left-width: 0px; display: inline; margin-top: 0px; margin-right: 0px; margin-bottom: 0px; margin-left: 0px; line-height: normal">style="padding-top: 0px; padding-right: 0px; padding-bottom: 0px; padding-left: 0px; border-top-style: none; border-top-width: 0px; border-right-style: none; border-right-width: 0px; border-bottom-style: none; border-bottom-width: 0px; border-left-style: none; border-left-width: 0px; display: inline; margin-top: 0px; margin-right: 0px; margin-bottom: 0px; margin-left: 0px; line-height: normal">)style="padding-top: 0px; padding-right: 0px; padding-bottom: 0px; padding-left: 0px; border-top-style: none; border-top-width: 0px; border-right-style: none; border-right-width: 0px; border-bottom-style: none; border-bottom-width: 0px; border-left-style: none; border-left-width: 0px; display: inline; margin-top: 0px; margin-right: 0px; margin-bottom: 0px; margin-left: 0px; line-height: normal">style="padding-top: 0px; padding-right: 0px; padding-bottom: 0px; padding-left: 0px; border-top-style: none; border-top-width: 0px; border-right-style: none; border-right-width: 0px; border-bottom-style: none; border-bottom-width: 0px; border-left-style: none; border-left-width: 0px; display: inline; margin-top: 0px; margin-right: 0px; margin-bottom: 0px; margin-left: 0px; line-height: normal"> illuminates an aperture in an opaque barrier located at z=0zstyle="padding-top: 0px; padding-right: 0px; padding-bottom: 0px; padding-left: 0px; border-top-style: none; border-top-width: 0px; border-right-style: none; border-right-width: 0px; border-bottom-style: none; border-bottom-width: 0px; border-left-style: none; border-left-width: 0px; display: inline; margin-top: 0px; margin-right: 0px; margin-bottom: 0px; margin-left: 0px; line-height: normal">=style="padding-top: 0px; padding-right: 0px; padding-bottom: 0px; padding-left: 0px; border-top-style: none; border-top-width: 0px; border-right-style: none; border-right-width: 0px; border-bottom-style: none; border-bottom-width: 0px; border-left-style: none; border-left-width: 0px; display: inline; margin-top: 0px; margin-right: 0px; margin-bottom: 0px; margin-left: 0px; line-height: normal">0style="padding-top: 0px; padding-right: 0px; padding-bottom: 0px; padding-left: 0px; border-top-style: none; border-top-width: 0px; border-right-style: none; border-right-width: 0px; border-bottom-style: none; border-bottom-width: 0px; border-left-style: none; border-left-width: 0px; display: inline; margin-top: 0px; margin-right: 0px; margin-bottom: 0px; margin-left: 0px; line-height: normal">style="padding-top: 0px; padding-right: 0px; padding-bottom: 0px; padding-left: 0px; border-top-style: none; border-top-width: 0px; border-right-style: none; border-right-width: 0px; border-bottom-style: none; border-bottom-width: 0px; border-left-style: none; border-left-width: 0px; display: inline; margin-top: 0px; margin-right: 0px; margin-bottom: 0px; margin-left: 0px; line-height: normal"> as shown below. Does the computed light pattern change as you expect when you change the source and screen locations? Are the edges of the light pattern sharp or fuzzy? (How do you define “sharp” and “fuzzy”?) Why? # a rectangular aperture that is centered on the origin.